Are you Investing in 10 Best Diwali "Muhurat" Picks of 2017? 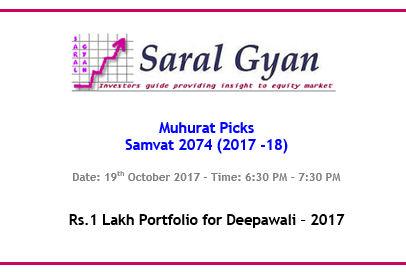 We are pleased to inform our readers that Saral Gyan Rs 1 Lakh "Muhurat" Portfolio - 2017 has been emailed today, on 19th Oct'17 to all our Hidden Gems, Value Picks and Wealth-Builder members. The performance of the same will be reviewed a day before Diwali festival next year. We have also updated all our members on our Rs. 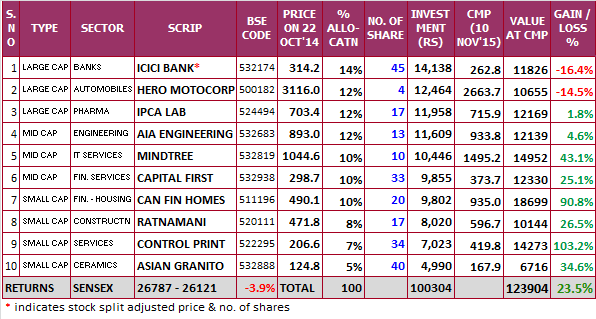 1 Lakh "Muhurat" portfolio recommended last year by our equity analysts. The "muhurat" trading session will be conducted for 60 minutes (06:30 PM - 07:30 PM) today, October 19, on leading bourses NSE and BSE. The special trading session would be conducted to pay obeisance to Lakshmi, the Hindu goddess of wealth and prosperity. It would also mark the New Year for traders as per the Hindu calendar, or Samvat 2074. If you wish to receive Saral Gyan Rs. 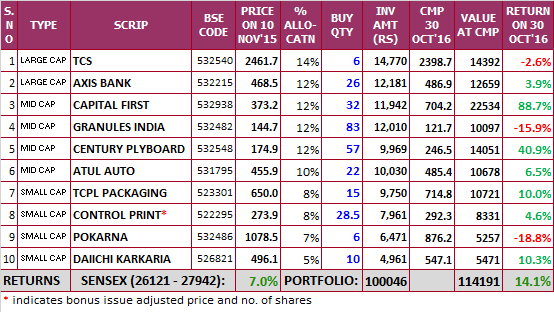 1 Lakh "Muhurat" Portfolio - 2017 of 10 Stocks, Subscribe Now! Join us on auspicious day of Diwali, choose any of our annual subscription services / combo packs under our ongoing Dussehra - Diwali offer - 2017 and we will activate your subscription within few minutes. As we are operating today on 19th Oct, we will ensure that you receive Saral Gyan Rs. 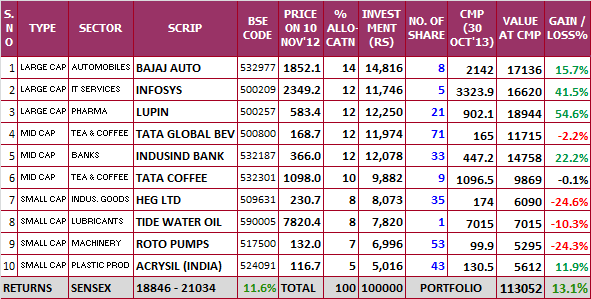 1 Lakh Diwali Muhurat Portfolio of 10 stocks well before "Muhurat" trading session today. Its time to also review our Rs. 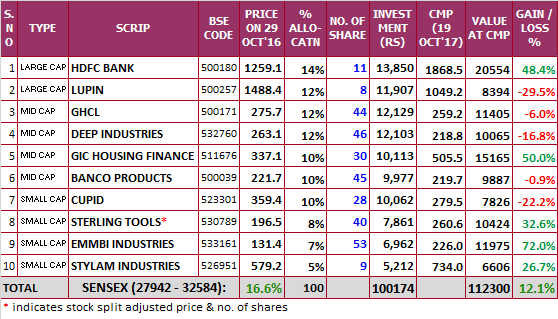 1 Lakh Diwali Muhurat Portfolio of 10 stocks of 2016 released by us on 30th Oct 2016, we are pleased to inform our Diwali Muhurat portfolio released last year has delivered returns of 12.1%. 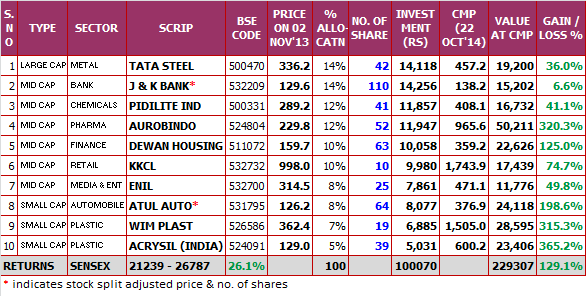 Five stocks out of ten of our Diwali Muhurat Portfolio of last year have given returns in the range of 25% to 72%. Star performers of our portfolio were Emmbi Industries (returns of 72%), GIC Housing Finance (returns of 50%) and HDFC Bank (returns of 48.4%), where as major laggard were Lupin and Cupid which have given negative returns of -29.5% and -22.2% respectively. If you are a new member and wish to receive Saral Gyan Rs. 1 Lakh Diwali Muhurat Portfolio - 2017 of 10 Stocks, simply subscribe to our subscription services under Dussehra - Diwali Offer of the Year. You can avail attractive discounts and freebies during this festive season. Offer is for limited period and closes on 25th Oct'17. We are glad to share that 46 Hidden Gems (Unexplored Multibagger Small Cap Stocks) out of 64 released by our equity analysts during last 7 years (till Dec'16) have given more than 100% returns. Moreover, 34 Hidden Gems stocks out of 46 have given returns in the range of 200% to 1900%. Value Pick (Mid Caps with Plenty of Upside Potential) stock like Amara Raja Batteries, Godrej Industries, Yes Bank, Aurobindo Pharma, Force Motors, Kewal Kiran Clothing, VST Tillers, V2 Retail etc have given returns in the range of 100% to 900%. We also take this opportunity to thanks all our readers for their association with Saral Gyan and look forward to a rewarding and long lasting relationship.